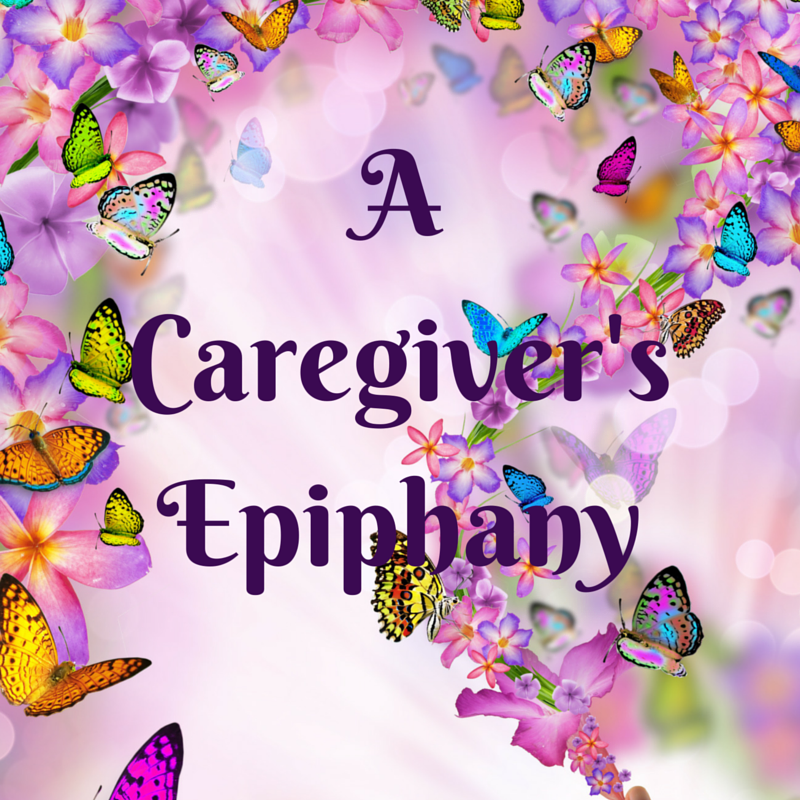 I became my mom’s caregiver when I realized my mother could no longer live on her own. She is almost 79 years old and suffers from Alzheimer’s disease. I have to admit that it was something that hadn’t often crossed my mind. I mean, I knew it would happen “SOMEDAY”, but “SOMEDAY” was a day that lurked way off in the distant future. It wasn’t until “SOMEDAY” snuck up and smacked me right across the face that I had to think and I had to do it really fast. So, I moved my mother in for better or for worse. Like most, I made countless mistakes but I did manage to do a couple of things right. I’ve been her 24/7 caregiver for a year and a half now. The one thing I have learned is that I had been her caregiver for many years before that, I just didn’t realize it. Taking her to the grocery, filling out forms, taking care of her personal business right down to putting those home perms in her hair every 3 months. You see, I didn’t see that as caregiving. I saw it as love. My love for my mom and trying to make her life easier. When I add those times up I realize that I have been caregiving for roughly 10 years. Taking care of all the little things to keep her from getting agitated. Like the time, she thought she had left her lightbulbs at Walmart only to find them in her freezer. Of course, I even took the blame for it saying that I must have been in a hurry. You know, as I write this, it finally hits me that she is not only suffering from Alzheimer’s but from her own stereotypes and prejudices about Alzheimer’s. All because she has this problem where she looks at Alzheimer’s as though she is becoming old and dumb and this has been her problem all along. I see now why she tells me that Ronald Reagan had Alzheimer’s almost every single day. In her eyes, he was one of the smartest men she knew. I see why we never really talk about “it” because she gets so upset. That’s what I love about writing. You can start off heading down a certain trail then all of a sudden a word or a phrase will jump out at you and you find yourself taking a whole other road instead! Because of where and when she grew up she has always had a certain fear, I’ll use this word for lack of something better, of being seen as dumb or not well-educated. This has made her painfully shy and socially awkward her whole life. So imagine how that fear was amplified when she find out that she now has Alzheimer’s Disease. She certainly didn’t go to Yale or Harvard. She went to college for one year and they taught her about CPR and making curtains, that is the reality of education in most parts of Eastern Kentucky. Not once did I ever look at her as being dumb, but I guess this is what she sees when she looks in the mirror. This epiphany breaks my heart. This is the woman who taught me to love words, books, and reading, above all else. She would sit with me for hours sounding out the words, teaching me to read before I ever went to school. This is the same woman who went to school and argued with them that yes, I should be allowed to check books out of the library in the first grade when this was strictly prohibited. She pulled a book off the shelf and handed it to me in front of my teacher and the principal and said one word “READ”. So I read and before we left that day I had my own library pass and I was the only first grader in the whole school who could go to the library during recess and get books. She did this for me. So my question is how do I convince her that Alzheimer’s Disease has nothing to do with getting old and dumb. That it is a disease, a thief, who sneaks in and robs you of every single thing that you hold near and dear. Who steals those words, books and reading that she so lovingly shared with me? How do I prevent myself from following in her footsteps when I recognize those same tendencies in myself. I guess we are more alike than I ever thought we were. Thank you so much Carol! I appreciate the advice! It is a very scary ride for sure but being able to share it and hear from other people in the same situation makes a world of difference. Thanks so much for commenting! I am touched by your love and care for your mother. My mother, in her last months with dementia and cancer, would say that she felt dumb. Sometimes I would try to talk her out of it, but often I would just hear her, and say it must be so hard and frustrating when her brain isn’t working the way it should. Thank you so much. I sometimes feels as if I were flying backward in the dark, but we muddle through the best we can. It makes me feel so much better knowing that there are people like you cheering me on! Once again, your post provides a thoughtful compassionate perspective on caregiving. It reminds me of when we began a similar journey with my parents, my sister said, “Isn’t all of life assisted living?” I love that you stumbled upon that second insight as you were writing. Tell your mom that the Alzheimer’s Club is reserved for only the smartest and wittiest on the planet. In addition to her and Ronald Reagan, here are some other members of this very selective club: Dean Smith, former coach of University of North Carolina-Chapel Hill–one of the winningest coaches in history and a great humanitarian. Pat Summitt, Coach of the University of Tennessee Lady Vols–again, and amazing woman and coach, and Tom Magliozzi the funniest guy you will ever hear on radio, host of NPR’s Car Talk. We’d be lucky if we could sit in company with these amazing human beings. Keep caring, keep writing. Lovely post. Your sister’s comment really brought it home for me. She is very astute! I appreciate the points of reference that I can share with her, I know she will love this. Thank you so very much for your wonderful words I appreciate the support more than you will ever know! I think it is important to continue to include your Mom in everyday activities and discussions. Bring up current events, home issues etc. Talk about the old days. It is okay to point out when she is beginning to get confused, but do so gently and with humor and let her know that you still value her opinion.It will difficult but acknowledge her disease. Let her know you understand the Ronald Reagan comment. And do not be too hard on yourself. This is life. No one gets a handbook. But you do get friends and family to figure it out together. I do some of these like continue to get the newspaper to give us more to talk about and to keep her up on current events and we usually spend our time in the kitchen talking about the “old days” when either she or I were children. Our problem is the isolation because we have moved here not to long ago and we are both very shy we have yet to make any friends here in SC. We are involved in the Alzheimer’s Walks and joined the committee this year to help get them ready and to also meet people but I am in the process of finding ways to get her out more during the day like a program that has transportation because I can no longer drive myself I think that would help her so much being around more people her age. Thank you so much for taking the time to comment. I really appreciate readers like you! Your devotion to your mother is a reflection of what a wonderful mother she has been to you. Education and intelligence are two very different things. Your mother sounds like a very smart woman – and so do you. Thank you so much, Sharon! Your guidance and support has meant so much to me and I cannot wait until Nashville to finally meet in person! Thank you! You are an amazing daughter! My mom is going to be 90 next week. Fortunately, she is still quite smart and able to take care of herself. But I’m there for her whenever she needs me. I see the pictures of your mom and you and she looks amazing I can’t believe that she is 90! I also see the close relationship that you share as well. We are a line of women and hopefully Alzheimer’s will not show up again for the next generations. I am an only daughter, I have an only daughter and my daughter has an only daughter. It’s an amazing thing when we all get together. I enjoy the same close relationship with my daughter as I do my mother now that she is an adult. When she was younger I was always “mom” first. Now we are great friends. They are my biggest supporters and I am for them as well. Family is everything. Thanks Janie! You have it right. Caregiving is simply love. Although the actual careGIVING is anything but ‘simple’. You are an example to the rest of us, Rena. I’m privileged to know you and your family! Oh Diane, you know how much I love you. You have been cheering me on since the very beginning and your opinion means so much to me. I talk about you all the time to my family and share your stories with them. My husband will say every once in awhile “So when are we headed to Canada to meet your friend”. It is and has always been my privilege to count you as my friend.Your support means the world to me! One-day dear friend I will head that way to meet you and I cannot wait until that day! This is such a tough one, because it’s hard to convince her. All you can do is keep reassuring her and loving her, which I know you are already doing. I also agree with the comment above, that sometimes you just have to let her rant and rave and get it all out, while you listen. Have a great week Rena! Thank you for your wonderful advice as always Lana! You are such a great friend to me as well as a place I can just put my head down and cry when I need to. I hope I can do that for you as well. I’m thinking of you this week. Thanks for sharing your story – it’s very well written and insightful. The struggles that mother and daughter go through are not always apparent. Thank you so much for reading and commenting Mike I really appreciate you comments and your support! I’m so glad you liked it! Thank you so much, Carol. I appreciate your friendship so very, very much! What a wonderful thing to say Linda and it is very much appreciated. I feel that mom showed me nothing but love my entire life and it is now my turn to be the one to take care of her. She’s my mom! Thanks for commenting! Wow Rena I was thinking about how your mother reminds me of mine–she didn’t go to college but was the most educated person I knew–and a royal pain in her older days but she was my mommy. No dementia just macular which sometimes I thought was worse as she had no independence but had her mind. My sister and I are just at the point of comparing “last day” stories and expressing our guilt. Anyway my mother insisted the library give me an adult library card when I was seven. When I was an adult and spent all my money on hard covered books she told me how spending money on books was never wasted–even if you had to sit in candle light to read them. And this was a woman who believed the depression didn’t end until the 1980’s. Love love love your stories. You’re a breath of fresh air! Never knew somebody who could take what could be such depressing material and make it not depressing. Isn’t that funny see we have so much in common and Nashville is almost here and I am getting more excited by the day! I can’t wait to meet you face to face! What you said about the depression not ending until the 1980’s cracked me up because according to mine it is still going on and Earth will be ending soon! So, so funny! If you can convince her that it is the disease, not that she isn’t smart would be great.Just like someone living with COPD or a heart condition, they have to stop and take rests and not overexert because of their disease. I think Rena you are doing great and this epiphany will only help both of you! That’s so funny Haralee because I often tell her it is like a cancer. That it is not her, that it is being destroyed by this cancer through no fault of her own. We had a really good conversation about it yesterday after a major meltdown on my end. I’m sure I will be writing about it soon! What a wonderful story Crystal. Mom has given up reading, but I never thought about reading to her. This is a great idea and I appreciate the fact that you took the time to leave such a terrific comment. This is so very touching, Rena! Many people have the mitsaken belief that mental conditions can be ‘controlled’! I can empathize with your mother feeling scared and am so glad that she has you to help her through this! Thank you so much Roshni! She is my mother and that’s a bond that transcends everything else. It breaks my heart to watch her get worse but we try to stay positive and enjoy every moment. Everybody has something and this is ours. Thank you so much! I am a part of that as well and am getting my post ready for Friday. I am just getting back after being sick for the last week and a half! I’m writing my introductory piece for tomorrow! Thanks so much!